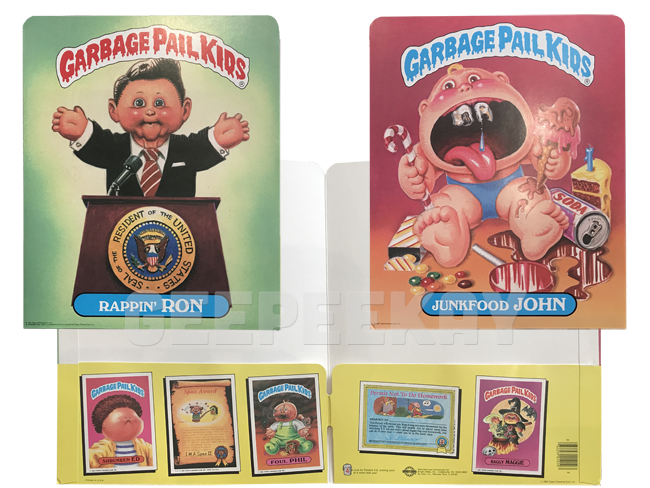 MADE BY: The Garbage Pail Kids School Folders were produced and released by Bright Ideas Inc. 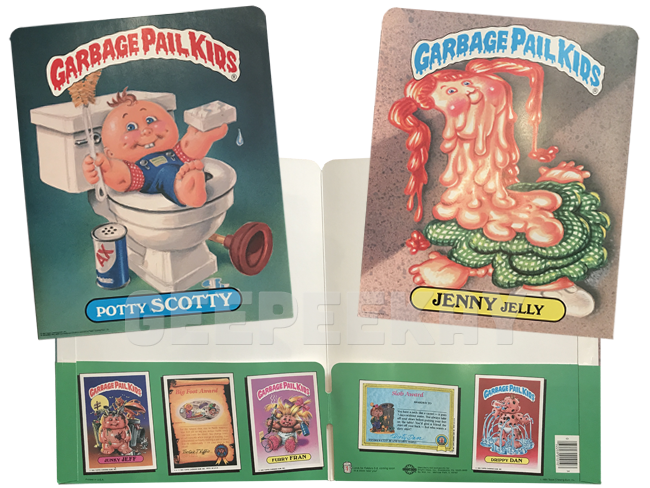 In late-1985 and early-1986 Bright Ideas released a number of 'school-themed' Garbage Pail Kids items. Perhaps the most common item from that collection are the School Folders. 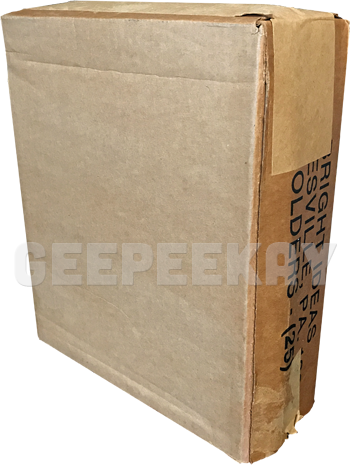 These large folders were typical of any folder at the time (or today for that matter) and featured a large image on the front and back, with a pocket inside to store papers, etc. 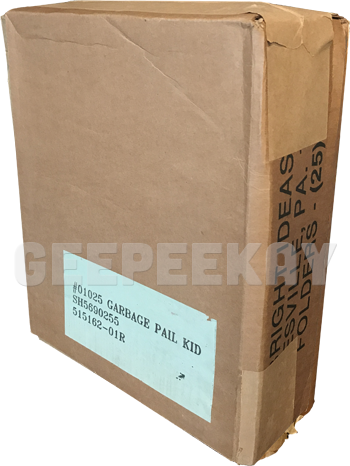 The School Folders were distributed in a cardboard display case that held 25 folders and was intended to be displayed on a countertop. Each display case was shipped in a brown box that acted as a sleeve for the case. 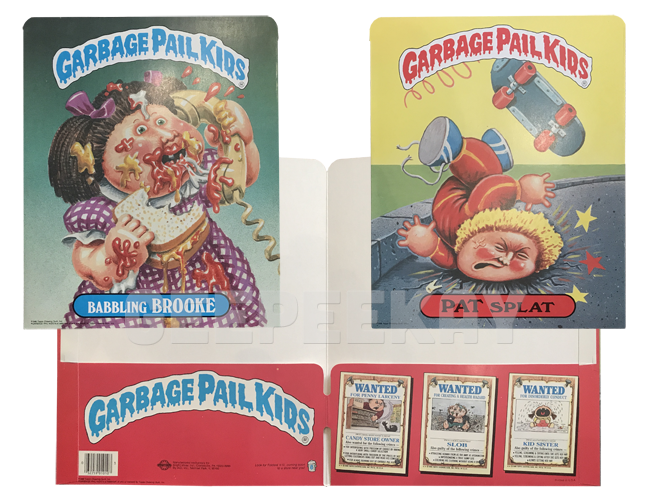 Below you can see pictures of not only the outer-box with GPK labels, but also the cardboard display case full of folders. 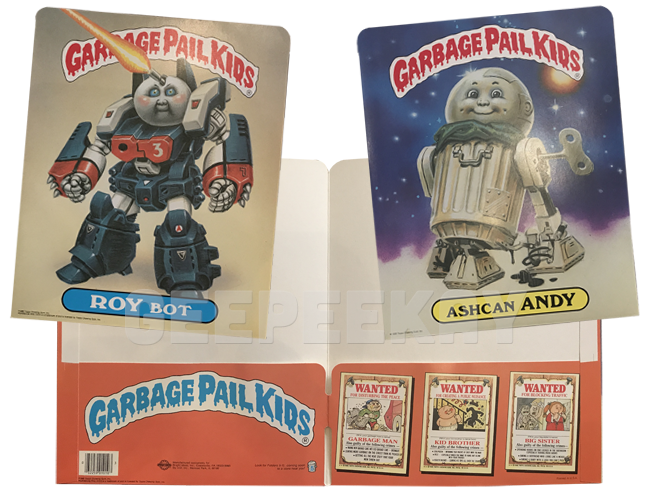 The folders were made with a single character (from the 1st, 2nd, and 3rd Series) on the front and back covers. 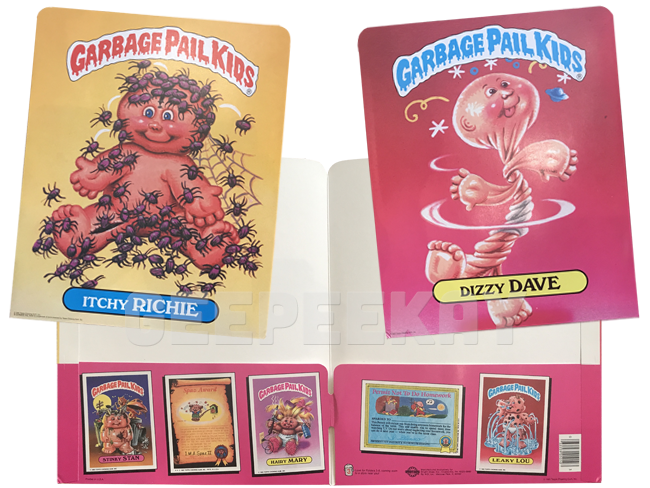 The inside of the folders contain various card fronts and card backs (from the 1st, 2nd, and 3rd Series) pictured across the bottom flaps. As mentioned above, these were released over the span of two years. 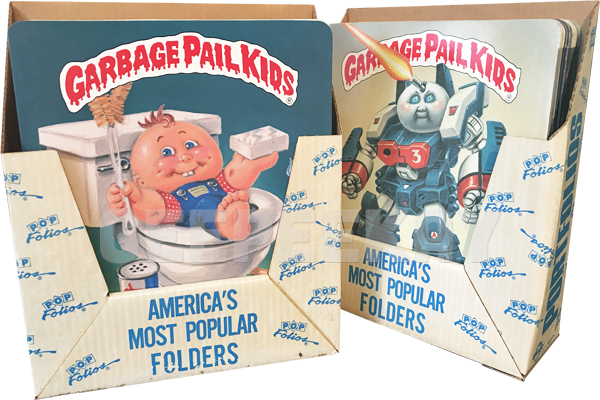 Folders numbered 1 through 4 have a copyright date of 1985. 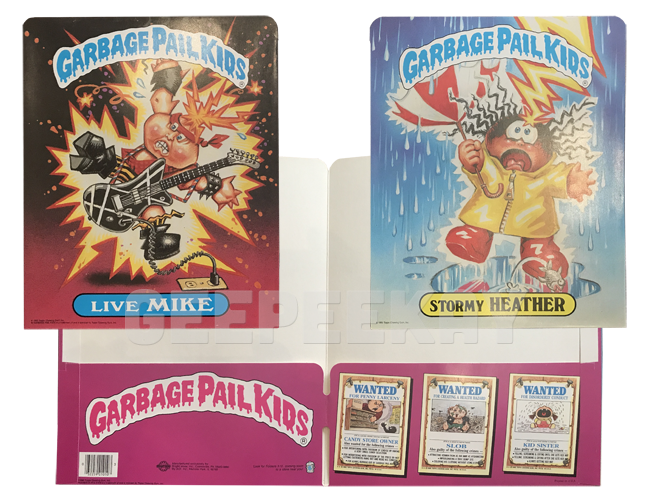 Inside they contain two card fronts and one 2nd Series card back on the left side, and one card front and one 1st Series card back on the right side. Folders numbered 5 through 8 have a copyright date of 1986. 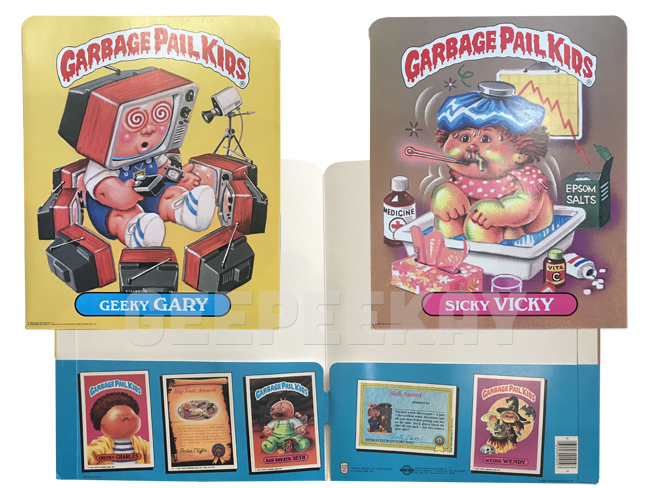 Inside they have the Garbage Pail Kids banner on the left side, and three different 3rd Series card backs on the right side. 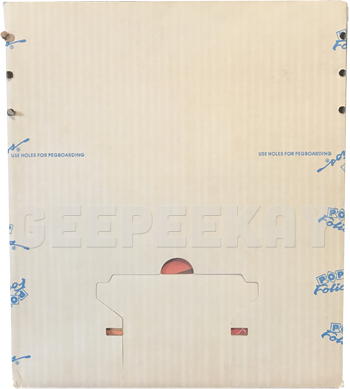 A look at the small print inside the folders shows these were in fact released in stages, but a closer look reveals that Bright Ideas apparently had plans for additional folders to be released. A note on folders 5 through 8 states "Look for Folders 9-12, coming soon to a store near you!" Obviously something happened to these plans and the folders were never released, leaving a complete set of Bright Ideas School Folders at eight. 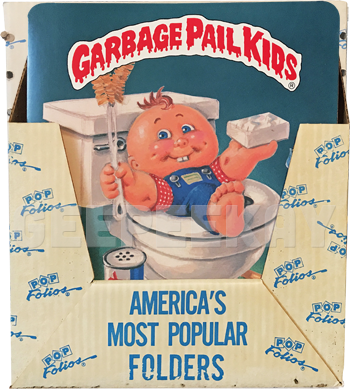 Below is a picture of a rare countertop display for PopFolios Garbage Pail Kids Folders. This display was spotted at a Flea Market, and the owner stated it had been in her family for years. Even though it has only been spotted this one time, the display is legit, and features the Topps copyright info along the bottom. 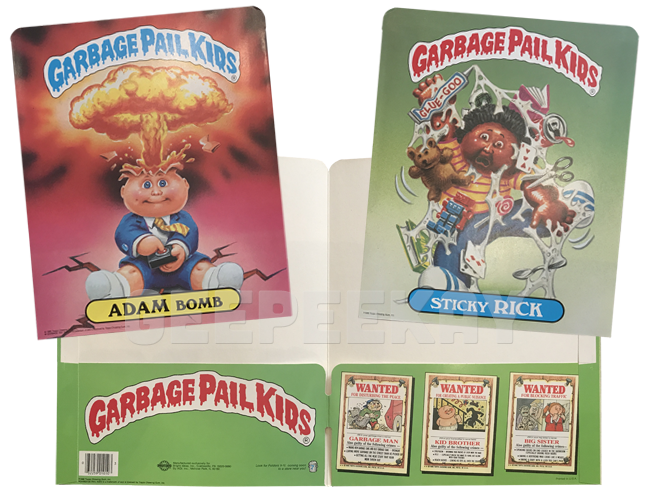 From the fun little details like the folder number being displayed inside a little trash can on the inside flap, to the variety of often unused Garbage Pail Kids characters on the outside of the folders, the School Folders from Bright Ideas are a great piece of both 80s and Garbage Pail Kids history!